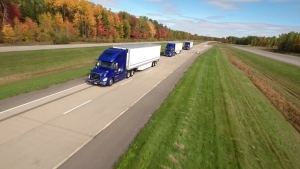 MONTREAL, QC – PIT Group, the research and engineering arm of FPInnovations, is in the midst of Transport Canada’s truck platooning tests that run from July 24 to August 18 at the Motor Vehicle Test Center in Blainville, Quebec. The same team first tested three-truck platoons in 2016, and this year is expanding the research to include a wider range of tractor-trailer configurations, speeds, following distances, weights, and traffic conditions. Supported by the ecoTECHNOLOGY for Vehicles program, the Cooperative Truck Platooning Systems testing program is a joint effort that includes the National Research Council Canada; Partners for Advanced Transportation Technology (University of California at Berkeley); the U.S. Department of Energy; the U.S. Federal Highway Administration; the California Department of Transportation; and Volvo Trucks. For its part, PIT Group is managing operations and providing trailers, drivers, test engineers and scientific equipment for the tests. Fuel consumption is measured using the Technology and Maintenance Council’s widely recognized test procedure.